Just Add Power (J+P)’s modular Ultra HD over IP video distribution system was selected and successfully installed at the Cincinnati Reds' Great American Ball Park. Charged with designing and implementing a visual system that would put the stadium on the cutting edge, technology solutions integrator Nor-Com outfitted the ballpark with J+P's state-of-the-art video distribution system, allowing the ballpark to distribute HD video to a range of sources throughout the venue. "J+P easily solves modern distribution challenges by providing modular system that can be scaled as needed," said Gary Snyder, technical resource manager for Nor-Com. "For the Reds, it offered us incredible versatility that was essential to fulfilling the organization's vision. Across the ballpark, we were able to put in a new bar or install a guest experience as their vision took shape, drop in 60 displays, and send protected HD content to any one of those displays with a snap of a finger." According to Nor-Com, J+P's robust Ultra HD Over IP platform has kept pace with the Cincinnati Reds' ongoing upgrades and video distribution requirements. When Nor-Com began implementing the IP-based system five years ago, it quickly became the platform of choice as it progressed through the extensive upgrades around the stadium. As a result, new rich video spaces continue to be brought online and updated for an experience that can be commanded with ease. Using J+P's Ultra HD over IP devices, the baseball team can distribute limitless sources throughout the facility. 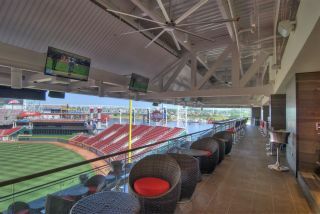 Most recently, Nor-Com used J+P's 2G and 3G transmitters and receivers within the newly redesigned Scouts Club, Champions Club, HandleBar, and the Reds Connect Zone for the 2017 Opening Day. Each of these four spaces offers a unique visual experience. Using J+P's Ultra HD over IP devices, the baseball team can distribute limitless sources throughout the facility, including HD tuners for the game feed, Blu-ray players, the scoreboard feed, laptop and PC inputs for presentation and digital signage, digital signage boxes, social media feeds, and a press feed. In each space, users can control and switch any source from an iPad. J+P's platform can be programmed within the organization's control environments. Because of the simplicity of the system, training is minimal, according to Nor-Com. Using the iPad, every display can be put in pregame mode and users can send specific sources to one or all displays in the room. This capability brings the technology to the forefront of the fan experience while minimizing system management and issues. "Sports venues today are challenged with entertaining fans in and out of their seats and staying on the cutting edge," said Taft Stricklin, sales team manager at J+P. "The Reds are a perfect example of why we design our Ultra over IP system the way we do. With our modular approach to video distribution, the team was able to cost effectively build upon its existing infrastructure and keep pace with evolving video content requirements and standards that allow them to stand out from the crowd."